When you think about low back pain, your mind tends to go to disc herniation or muscle strain. Very rarely does it go to sacroiliac (SI) joint dysfunction. But recent studies show that up to 30% of low back pain is caused by an issue in the sacroiliac joint. What is the sacroiliac joint exactly? 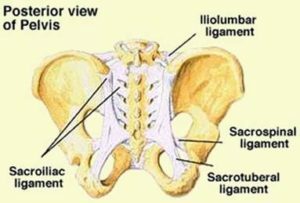 The sacroiliac joint joins the sacrum (triangular shaped tail bone) to the ilia (“hip bones”)…hence sacro-iliac. These joints play a large role in the ability to walk and move the torso, therefore they are used a lot…and quite often overused. Many muscles and ligaments surround and attach to the SI joint and can contribute to pain and inflammation if the joint is dysfunctional. The joint relies highly on the strength of these ligaments for support and structure. How can the SI joint become dysfunctional? There are many causes of SI joint dysfunction, but the most common mechanism of injury is due to a combination of vertical compression and rapid rotation (lifting a heavy object and twisting). These motions create both a load and a shearing of the joint which is the action the ligaments are meant to resist, however, when done repeatedly, the ligaments weaken and become less effective. Falling on the buttocks can also create the load and shearing of the joint causing a similar dysfunction. Anatomical alterations such as leg length differences, gait abnormalities, scoliosis, and even pregnancy can lead to a predisposition for dysfunction. What are common symptoms of SI joint dysfunction? Common symptoms include pain in the low back, buttocks, leg, groin and/or hip, urinary frequency, and intermittent numbness or tingling. The pain can range from sharp and stabbing to dull and aching and tends to increase with physical activity. The pain can also increase with sustained positions such as prolonged sitting or standing in one place for a long time. 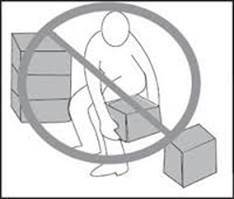 Actions such as bending forward, climbing stairs or hills and standing from a seated position can also provoke the pain. The symptoms vary so drastically from one patient to another because there are several muscles and nerve roots involved which causes the pain to manifest differently in each case. The muscles that can affect the sacroiliac joint include the piriformis, rectus femoris, gluteus maximus and minimus, erector spinae, latissimus dorsi and iliacus. These muscles can be found in the buttocks, thigh, mid back and low back, thus causing pain in any of these areas. The nerve supply to the SI joint ranges from the upper portion of the lumbar spine (low back) all the way down through the sacrum (tail bone region) which creates a unique pain referral pattern for each person depending on which nerve roots are affected. How can SI joint dysfunction be diagnosed? Imaging studies such as x-ray, CT scan, and MRI do not usually show abnormalities and therefore are not reliable for diagnosis. However, a clinician…like a CHIROPRACTOR J, are highly trained in the diagnosis of musculoskeletal problems and can reach a probable diagnosis of SI joint dysfunction using a hands-on approach through palpation and orthopedic tests which provoke the pain thus giving a positive result. There are many of these tests designed to indicate SI joint problems, but testing positive three particular tests is both sensitive and specific to a correct diagnosis. Those tests are called Patrick’s Test (or FABERE’s), Gaenslen’s Test and Yeoman’s Test and are demonstrated in the picture below. How is SI joint dysfunction treated? Treatment is usually dependent on duration and severity of the pain and dysfunction. New injuries and even recurrent flare-ups or exacerbations benefit greatly from chiropractic manipulation because we are able to realign the pelvis to its proper orientation and perform any soft tissue treatments necessary to relax the muscles and ligaments that may be contributing to the dysfunction. Chiropractors can also help stabilize the SI joint using a multitude of different taping techniques as well. If the dysfunction is severe enough, combining physical therapy with chiropractic care is indicated. In worst case scenarios, steroid injections and even surgery may be necessary to completely relieve the pain. As a chiropractic physician, it is always my goal to treat any musculoskeletal issue conservatively first before resulting to invasive treatments like injections and surgery because there are always adverse effects to those treatments such as immobilization and chronic pain. So if you are experiencing low back pain that does not seem to be going away, come in and see me!